"Circular Panorama of Electric Tower", the focal point of the Pan American Exposition. 360 degree pan taken from near the north side of the Electric Tower, with views of the Popylaea collonade, the Transportation Building, Mexican Plaza, the Stadium and the north side of the Electric Tower. Crowds of tourists walking around the area w/ collonades, statuary, elaborately decorated architecture (a Spanish Renaissance / Greco-Roman mix). PANORAMIC VIEW OF THE ELECTRIC TOWER FROM A BALLOON. "Balloon camera" not aimed downward but sideways whilst riding up and down in the balloon beside the famous 375 ft Electric Tower, the centerpiece of the Pan-American Exposition. Shot starts at the base of the tower where 2 colonnades attached to the square tower form a large semi-circle space opening toward the Court of Fountains; in fact a great gush of water comes right out of the base of the tower itself, spiling down into a pool w/ other fountains. Pan up the side of the Tower decorated with elaborate lattice work patterns. On the very tgop therer is a cupola with a statue of a winged "Goddess of Light" perched on top. Then camera again descends slowly to the base; there are a few visitors to the fair passing by. NOTE: The entire framework is of steel and was the design of architect Howard Cobb of New York. Unfortunately we can't see the color scheme - -a creme white, trimmed in blue and gold- -or the effect when it was brightly lit with electric lights at night. President William F. McKinley and his entourage (President Milburn, of the Pan-American Exposition, Secretary Cortelyou, and other VIPs) stand in the reviewing stand and take the salute of the passing American infantry troops (marching by in FG) in the Stadium at the Exposition. "Panorama of Esplanade by Night" at the Pan-American Exposition in Buffalo, 1901. Slow Pan on the exhibit buildings outlined by thousands of glowing lightbulbs - -reported to have been marvelously colorful! 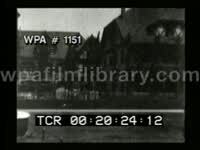 Pioneer camera operator Edwin S. Porter maintained that this was the first motion picture taken at night by incandescent light in America. Brilliantly illuminated buildings of the 1901 Pan American Exposition - -this illumination every evening was one of the great attractions of the Fair. First a shot during daylight, panning from the Ethnology Building to the Electric Tower. Then cut to a shot from same camera position in the evening as the lights come up on the Electric Tower. 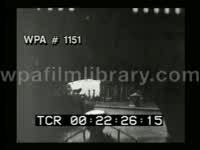 As the lights reach their full brightness, with a searchlight at the top of the Electric Tower moving back and forth over the grounds, the camera again pans slowly left to the brilliantly lit Temple of Music. "The Esquimaux Village LS low structure which looks like it is made of snow/ice (supposed to resemble an igloo) beside a small pool, and an ice floe. 4 dogs pull a small dog sled with a person riding on it alongside the pool and into the 'igloo'. Several Eskimos dressed in outfits that look like jogging suits run to and fro alongside the pool. Next, some sled dogs are led in front of the camera. Entertainment at the Esquimaux Village at the Pan American Exposition, 1901. Visitors were promised a look at Eskimos in their natural surroundings pursuing their usual pastimes. 2 Eskimo men are snapping whips on the ground, in some sort of game or contest - -maybe they are hitting some sort of targets? (it's hard to see). 2 other Eskimos, a man and a woman, stand watching them, in front of a large tipi (tepee?) of animal skins; icy Arctic scenery in BG. 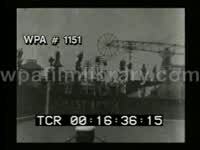 Filmed at The "Japanese Village", one of the exhibits on the Midway at the Pan-American Exposition. 3 Japanese boys (ranging in age from c. 7-8 - teenage) wearing white shirts and dark shorts come running into view and start doing a gymnastics routine; BG is a two-story house with a balcony, and plants and trees in small garden, also looks like some narrow pooles in garden with small parasol tops on them. The boys perform back handsprings, back flips, unusual handstands, lifts, successions of round-offs etc. A young Japanese man in western dress stands at rt. watching; and several other people (most in Western attire) show up and hang out in front of house watching. Prize-winning horses at the Pan-American Exposition parade on the "Esplanade". Shot of the paved street with spectators along the curb waiting; Electric Tower and other exposition buildings in BG; lt's been raining - -there are a lot of puddles on the street. (Actually the heavy rains during the Pan Am Expo wreaked unforeseen havoc on the plaster facades of the temporary buildings!) A band in uniform marches past; and following that are many show horses of various types - -Kentucky thoroughbreds to Canadian draft horses- - from all over North America; the horses are led by their handlers. Entertainment at the Esquimaux Village at the Pan American Exposition, 1901. Visitors were promised a look at native peoples in their natural surroundings pursuing their usual activities.... in this case playing "Eskimo leap frog." People clothed as Eskimos play a game of leapfrog in front of structures resembling igloos on ice floes. "Spanish dancers at the Pan-American Exposition." (As with some of the other entertainment at the Exposition, it's not certain whether these folks are actually Roma or Sinti, or if they are just pretending to be.) Buffalo, NY, USA Several Gypsy women in costume perform a high-spirited dance in front of a building or wall, a tent under a couple fake palm trees; sign on leaning on a gypsy man stands in BG watching, and some visitors are seen walking past behind him. The dancers twirl around and swinging their voluminous skirts about, some doing high kicks and showing a little ankle. Occasionally a dancer stands in one position while revolving her hips and even throwing in a few pelvic thrusts! (Maybe that's why a contemporary Edison film company catalog referred to this as the "famous Gypsy dance that created such a furor at the Exposition" and promised that "Features of the well known couchee couchee are introduced by some of the dancers." 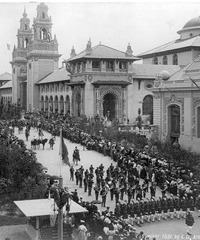 "The Mob Outside the Temple of Music at the Pan-American Exposition." Shot of crowd, reportedly just after the assassination of President William McKinley - - there's not much excitement, nothing like what one would expect from the description given in original Edison catalogue (See Note.) 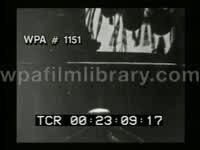 Camera pans just over the heads of the crowd, positioned at such a height behind the large group of people that mainly hats are visible - -and a frowning baby in a big straw hat, held in mom's arms. The crowd are looking at platform in BG where there are 2 small tables each with 4 chairs and people sit there, some writing something. (If this is indeed after the assassination, maybe they are questioning people and getting everyone's personal information?) Also behind crowd are various kinds of uniformed men (guards from Exposition?). Toward the end one can see more movement in the crowd in BG. Still nothing "intense" or "frantic" as described in Edison catalogue. Possibly some of this film is missing or else it is misidentified. 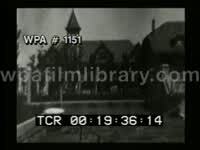 The footage doesn't seem to correspond with the following description from a contemporary Edison film company catalog: " On Friday, September 6th, 1901, we had our cameras in position to photograph the President as he left the Temple of Music, but the deplorable assassination, of course, prevented our getting this picture. We did, however, secure an excellent panoramic view of the mob surging in front of the Temple of Music attempting to get at the assassin. These pictures have created intense excitement and interest. 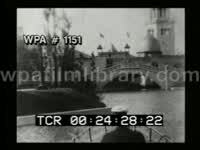 Our cameras were the only ones at work at the Pan-American Exposition on the day of President McKinley's speech, Thursday, September 5th, and on Friday, September 6th, the day of the shooting. This picture was photographed immediately after the shooting, and shows the intense excitement of the people. The Pan-American Exposition guards are plainly seen in the background trying to check the frantic multitude as they sway backward and forward in their mad endeavor to reach the assassin." Sham battle continues; more LSs of soldiers on knees firing into cloud of smoke in which one catches vague glimpses of the Indians. LS The soldiers enact some dramatic battlefield heroics and deaths; other individuals don't show such theatrical inclinations and can be seen calmly walking or standing about. The Indians make a great charge, succeeding in getting most of the way across the stadium (toward cam). A group of soldiers pop up in FG - -CU as they affix their bayonets, advance, all fire their weapons and then charge, chasing the Indians across the field. After this there's a bit with guys on horses and more guns firing but doesn't seem to be part of the battle. Then again the rest of it seemed almost as unfod Then all of the participants leave the field. The 1901 Pan-American Exposition in Buffalo. 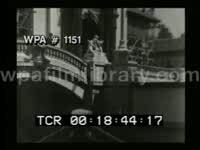 MSs President McKinley and entourage sitting in parade stand, watching soldiers pass by; MS McKinley standing at barrister, nodding to crowd; great panning MS crowd of hats at public reception at the Temple of Music. Cut to MSs heavily adorned coffin of President McKinley being unloaded from train, carried away, MS THEODORE ROOSEVELT saluting the casket, hat to heart, MS casket being loaded into carriage, TLS horse-drawn carriage (funeral train) departing. View of the major exhibit buildings in various architectural styles as the boat makes its way through the canal, going through tunnels and under bridges & past amusement attractions. Starting in the "Streets of Venice" section on east side of the Exposition grounds. 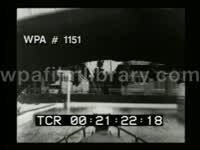 POV as our boat passes under the west Mall bridge, then and continuing on its course past the Bazaar Building, toward "Darkest Africa" section. View of the major exhibit buildings in various architectural styles as the boat makes its way through the canal, going through tunnels and under bridges & past amusement attractions. POV from boat turning many corners and passing under many bridges, you also see gondolas rowing through the canals. View of the major exhibit buildings in various architectural styles as the boat makes its way through the canal, going through tunnels and under bridges & past amusement attractions. POV from boat as we pass under another bridge, then past stadium on right and row of trees on left, heading toward the Canada building. View of the major exhibit buildings in various architectural styles as the boat makes its way through the canal, going through tunnels and under bridges & past amusement attractions. POV from boat heading toward the Canada building. Other gondolas pass by. View of the major exhibit buildings in various architectural styles as the boat makes its way through the canal, going through tunnels and under bridges & past amusement attractions. POV from boat turning to go under bridge and turn past the U.S. Government Building and the U.S. Ordinance Exhibit where heavy artillery guns are displayed outside. View of the major exhibit buildings in various architectural styles as the boat makes its way through the canal, going through tunnels and under bridges & past amusement attractions. POV as our boat approaches and passes the Forestry and the grounds of the "Six Nations of the American Indians", a wooded area with log huts, wigwams. View of the major exhibit buildings in various architectural styles as the boat makes its way through the canal, going through tunnels and under bridges & past amusement attractions. POV from boat on to Mirror Lake, we skirt the bank of the lake, all paved, passing the pergola & heading toward structures of the main entrance, hanging on a wire between 2 towers there are 7 discs with streamers hanging from them and small flags stuck in the top. View of the major exhibit buildings in various architectural styles as the boat makes its way through the canal, going through tunnels and under bridges & past amusement attractions. POV from boat as we head into "The Grotto" a curved tunnel (info on the exhibition says it took about a minute to pass through so they must have cut out all but entrance and exit, since it was too dark to film the tunnel interior which is described as covered with tropical foliage). Our boat emerges out onto lake surrounded by more collonades and buildings. View of the major exhibit buildings in various architectural styles as the boat makes its way through the canal, going through tunnels and under bridges & past amusement attractions. POV from boat as we turn and head toward and pass under a Venitian style bridge and end up in the "Streets of Old Venice" section which of course attempts to replicate that city. View of the major exhibit buildings in various architectural styles as the boat makes its way through the canal, going through tunnels and under bridges & past amusement attractions. POV from boat passing through "Streets of Old Venice" section, there are a lot of people here, boats lined up along the bank and oddly enough, on one boat there's a guy dressed up in furs and feathers like some "savage" caricature, waving a tomahawk sort of weapon around in a threatening manner much to the amusement of some tourists. 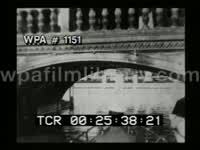 We pass under another bridge, then the film ends.